Social media has exploded in popularity in recent years and more and more business owners are taking advantage of this to promote and grow their company. There are many people who are still sceptical about the benefits of using social media in business, but it is fast becoming integral for businesses in 2015 and beyond. It is being used in many different ways, from promotion and brand awareness to providing a unique customer service platform that more traditional methods of communication cannot compete with. Having a presence on social media is now a necessity for any forward thinking business. However, it can be seen as a bit of a minefield with so many different networks and platforms on top of countless apps and tools to help manage these social media profiles. The benefits of a well run social media presence for your business are many, and this article will highlight eight of the best and also take a look at how you can take advantage of them. Social networks are a great way of finding new leads and customers for your business, and they can also be more cost-effective compared to traditional methods. You can bet that most of your potential customer base are on social media in one form or another, and finding out where your audience hangs out on social media and then engaging with them will help you to grow your following and potential customer base. Monitor any existing social media accounts you have carefully and make it your goal to answer every inbound tweet, post, or blog comment in a timely fashion to give your business a sense of professionalism. Social media monitoring – Social media monitoring is not just for customer service. You should also be monitoring social media for terms relating to your product, service or industry. Look out for people who are looking for recommendations or advice from friends that are related to your business. Also keep an eye out for general discussions or questions about your product or service – this can provide you with up to the minute opportunities to engage with people that are already interested in your product or service. Offer advice, information, and expertise at the perfect time and without the added pressure of a typical sales situation. There are lots of great tools that can help you monitor social networks. Hootsuite is a social media management application that allows you to view multiple social media accounts in one handy dashboard, set up multiple ‘streams’ that can monitor for brand mentions, and schedule future social media output across multiple platforms. Keeping a watchful eye on mentions or requests can be a great way of finding new leads and potential customers. Use Images – Try to use images as much as possible when posting on social media. It is well documented that tweets or posts that include images are up to twice as likely to be shared/liked/retweeted. So always try to include images in your posts whenever possible to increase your posts reach and potential for finding new readers and potential leads. Advertise to look-alike audiences – Using look-alike audiences on Facebook you can create an advertising segment that is similar to a specific list of your current customers/followers – for example your email subscribers. This can give you the opportunity to target a brand new audience with very similar characteristics to the audience that you already know have an affinity with your brand. It can be an excellent way to generate leads that are more likely to convert into customers. 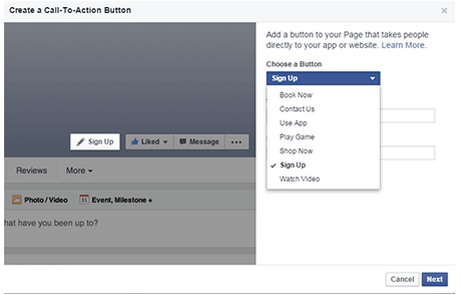 Facebook CTA feature – Facebook recently released a new call to action (CTA) feature, giving you the ability to choose from seven CTA buttons including SIGN UP, CONTACT US, and BOOK NOW. This new CTA feature will appear at the top of your Facebook business page and give you a new and easy way to generate leads direct from your Facebook page. Simply click on the drop down menu next to your page’s cover photo like button. Then choose your CTA phrase and where you want the CTA button to link to. Twitter lead generation cards – Twitter lead generation cards help you to find and connect with users outside of twitter that might be interested in what you have to offer. This feature allows you to put a call to action button in your tweets, which can be clicked on by the prospect allowing them to share their details and email address with your business without having to leave twitter. This can be very useful for generating leads directly from your twitter output, and it’s free! To set up your own lead generation cards, log in to twitter and then click the settings icon and select ‘twitter ads’ (it has to be set up in twitter ads but it is a free service). Then click on the ‘creatives’ tab in the top nav menu in twitter ads and select ‘cards’, click ‘create your first lead generation cards’ and that’s it! You can have an unlimited number of cards so get your fill! Social media can provide some incredible insights into your audience and potential customer base. From age or demographic details to how many likes/shares a post receives, monitoring your social networks can give you in-depth information that can help you to better understand your audience’s likes and dislikes, allowing you to cater more effectively to their needs. And by monitoring what the competition is up to on their social channels, you can get clues as to what is working for them too. So how can you gain these valuable insights and utilise your findings? The best way to dig a bit deeper into your audience is to use some of the fantastic (and often free) tools that are available. Google Analytics – Google Analytics is a free tool that can be a great resource for all sorts of different data, not least social referral statistics. You can use goals to help you establish which bits of your social media output lead to conversions on your website and which bits of content provide the most traffic and when. This can allow you to zero in on exactly which types of content convert best and so enable you to tailor future content towards what works best. To get social data from GA, use the standard Social Media Report function in ‘Traffic Sources’ > ‘Social’. This allows you to explore which social networks are sending traffic to your site, how long they stay, how many pages they view, the bounce rates, and more, giving you an idea of where to focus your attention when it comes to social media. You can also set up goals that will allow you to see which networks lead to conversions and the values of those conversions. For information on using Google Analytics check out this great guide from Social Media Examiner showing you how to get started, view reports and customise your GA data. Although GA doesn’t cover all social networks it does include all of the major players like Facebook, Twitter, Pinterest, Stumbleupon, Google+, LinkedIn and more, and can prove to be an extremely useful tool for social audience statistics, helping you to understand what your audience like and engage with. Followerwonk – Followerwonk is a tool specifically designed for Twitter by Moz (formerly SEO Moz) and is an excellent way of gaining detailed information on your followers and activity on Twitter. Simply click on the analytics tab, enter a twitter handle and view information on followers and those being followed. It can show you when followers are typically online, when you usually post and can also put followers in categories such as social authority, activity, total tweets, and follower count. This tool can be really useful for finding out information on your following and for growing your audience by allowing you to search through bios, compare twitter accounts, and match your activities to gains and losses. 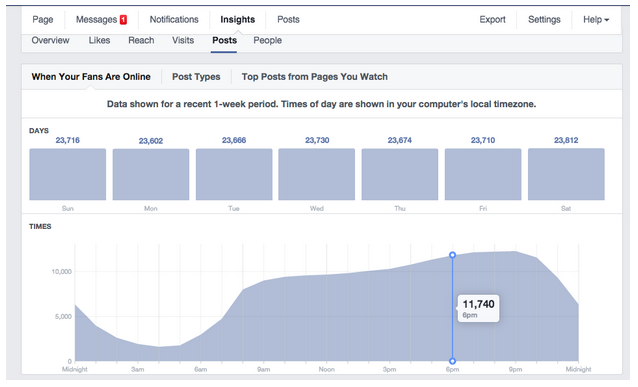 Facebook Insights – Facebook Insights is available to all Facebook page admins and shows the statistics of all of your posts, your fans, and post reach. You can also keep an eye on the competition by setting up pages to watch, which gives you information on the performance of other Facebook pages. You can break down information on Facebook likes into demographics, such as male, female, age groups, and languages, all of which can be very useful to you when looking into the make-up of your following. The ‘people’ section can be particularly useful for breaking down fans, people reached, and people who engaged with your posts into age groups, places, and by language and gender. These tools can give you valuable insights into your audience, showing you what kinds of people typically like your products and engage with your social media. This allows you to tailor and target your output, and even offers, products or services, more towards those people. There are many other tools available, both free and paid subscription services that provide all kinds of analytics and data. Check out this fabulous guide on the best of the rest from Kevan Lee originally posted on bufferapp.com. At the same time as increasing your knowledge about your customers and following online, social media can help you to gain similar insights into your overall market and particularly your competition. Monitoring your competition’s social media offering can help you to build up a picture of what is working well for them and also where they are not so successful. This can give you an opportunity to alter or adapt your own offering accordingly. Try to match or improve on the things they do well but also take advantage of where they are falling down, try to offer something new or different. You can set up alerts and monitoring of your competitors name or product in much the same ways as you might for your own. There will obviously be some things that you will not have access to, like their Google Analytics, but there are plenty of handy tools and cheats to help you to stay ahead of the competition. Google Alerts – Google Alerts is very simple to use, allowing you to monitor mentions of a company name, product, brand or any key phrase for that matter. You can monitor for your competition’s backlinks or even simple mentions on social or across the web. InfiniGraph – InfiniGraph is a social media tool that shows you what is trending in your social media circles. This free tool also lets you see what is trending in your industry and can be used equally well for tracking the social trends of your competition. You can filter out different social networks and different types of content, and you can see lots of statistics such as performance, average engagement per post, and average engagement per post by content type. This allows you to really dig down and find out what is successful and what isn’t for your competitors. Marketing Grader – Marketing Grader is a free tool from Hubspot that monitors the social activity of your competitors. This handy tool grades a brand’s blogging and SEO success, lead generation, and social activity, and gives them an overall score, allowing you to monitor their success over time and compare scores. Knowledge is power, and the more you know about your competition the better. Try to keep an eye on what your competition is up to at the same time as monitoring your own social media success – it will give you a more rounded view of your industry as a whole. Monitoring what the competition is up to will allow you to make the most of popular trends in your niche and take full advantage of their successes and failures. Social media provides the ideal platform for creating, building, and maintaining important relationships with your customers, suppliers, and influencers in your niche or market. Social media offers an immediacy of contact with your audience that no other platform can match. Networking has always played an important role in business, and networks like LinkedIn have made this easier and more accessible for many. Find out where your audience spends the majority of their time online and where your brand enjoys the greatest following, then respond and focus your attention on engaging with these communities as much as possible. Do some research to find out where other brands in your niche are most involved, as it is likely that customers across your industry as a whole will tend to gravitate towards certain networks. Once you have identified where your target audience hangs out online it is time to jump in and get active in discussions and conversations in an authentic way. Join in with relevant forums and solicit feedback from your peers and followers alike. Get a feel for what they want and respond to. Having hundreds or even thousands of followers is great, but it is the core audience in your industry that has the people you really need to try to engage with. Zero in on them, talk to them, and keep conversations going. The more genuine and helpful you can be the better. Once you have built up your core following, try to engage with them as much as possible – be accessible. A sparse or sporadic presence online is often as much use as non at all. You don’t need to convince everyone out there about your brand, just take care to focus on the core audience in your niche. Social media can magnify a reputation, whether good or bad, so go out of your way to treat your audience like people, go the extra mile to engage with and provide value to your audience and the good word should spread – fast. LinkedIn – LinkedIn is a social network, much like Facebook, but specifically tailored towards business. If you are not on LinkedIn already create a profile and add to it over time. It offers free and paid packages and has over 300 million users worldwide. Manage your professional identity, build and engage with your professional network, and get access to knowledge, insights and opportunities. Using LinkedIn can be a great way to find new contacts and manage and build on current relationships that you have. Social media allows you to target your audience, and you can do this using various parameters. With Facebook and Twitter you can target posts or promoted ads at an audience by their IP address (where the user logs in from) or their recorded address, and these can be further segmented by country, state/province, city, post code, and so on. This is an extremely useful and cost-effective way of getting your message out to a specific audience in a specific location. You can then further target within those locations by things like age, gender or language, resulting in a super-focussed and targeted audience for your post or ad that are much more likely to convert. Target any Facebook status update – If you don’t want to spend money on social advertising there are ways you can geo-target for free. Within your own Facebook fans you can focus in on specific audiences using post targeting. This is available in the Admin panel under Edit Settings > Post Targeting + Privacy. When you turn this on you will see a little target image along the tab that has the schedule, location and image buttons. 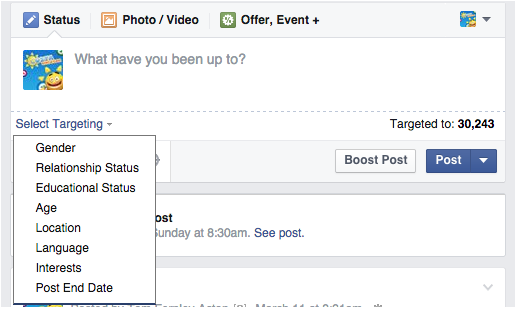 This will now allow you to add your own targeting. Promoted Tweets – Twitter’s promoted tweets will let you quickly target your tweets using options such as keywords, interests, followers, television, and tailored audiences. Although it is a paid platform, it allows you to target your tweets using a number of targeting criteria, which helps you cut through the noise and find the conversations that your content needs to be in. Social media has given businesses immediate access to public opinion regarding their brands. Whether the feedback is positive or negative, it provides the brand with excellent insight into the customer perspective and offers a way to instantly combat any negative issues, quickly contact disgruntled customers, or spread the word about particular successes. Never before have consumers or business owners had the opportunity to spread the word so quickly (or so far) about experiences that they have had. Many larger companies now have dedicated social channels for customer service – Nike’s @nikesupport, for example, has over 90,000 followers. It is extremely important that you monitor your social channels and social media for customer queries and complaints related to your brand. This is because the rise in social customer care seems to have also led to a rise in expectations, with some polls suggesting that over 40% of consumers expect a response on social media within an hour. Check out our recent infographic on social media customer service for lots of facts and figures, some interesting (and funny) examples of social media service faux pas, and heart warming wins. Social media management tools – Using tools can help you to keep on top of all of your different social channels and monitor for mentions of your brand. Tools like Hootsuite and Sprout Social let you see all of your social media accounts in a handy dashboard so that you can monitor all of your accounts easily and in one place. You can set up different profiles or streams to check for brand mentions and requests alongside all of your social output, and you can also schedule future posts. These tools can be particularly useful if you are present on multiple platforms. You can set up alerts using Google Alerts and use Twitter searches to make sure you are amongst the first to hear about any new topics or trends, allowing you to respond in a timely fashion. Social media has given business a way to do customer service like never before, offering a cost-effective and speedy solution to keeping on top of any issues or complaints. When done well social customer service can act as a marketing aid for your business – all of your followers will be able to see when you deal with negative situations quickly and effectively. Equally, when done poorly, social customer service can see criticism snowball rapidly, showing your business in a negative light and in a very public arena. So keep an eye on your social profiles and respond in a timely and professional manner, because this can have a huge impact on how your brand is viewed within your industry and across the wider web. Some 71% of consumers polled, having received a quick response from a brand on social media, said that they were more likely to then recommend that brand to others. Ensuring that your content gets in front of your audience and potential customers has been made infinitely quicker, easier and in many cases more cost-effective through the rise and use of social media. You can now push your content out through your companies social channels, often negating the need for paid press releases or time-consuming email campaigns. Simply churning out content isn’t enough, though. It has to be of interest to your audience, share worthy, and generally in line with your brand’s ethos. Social platforms like Twitter often limit the length of posts so including links or images can help. Bitly – URL shorteners like Bitly are a good way keep your post short and tidy whilst still making sure it contains the information you want to include. Bitly also allows you to see statistics on each of your shortened links, showing you how many clicks they receive, who clicked, and what days/times were most popular – essential information if you are to tailor and schedule your content effectively. Timing – Deciding when to release your content through your social channels can be just as important as the quality of the content itself, and you can easily find out when your audience is most often online with a little testing. On Facebook, check your insights tab to see handy graphs depicting when the greatest percentage of your audience is typically online. From here useful patterns can often be found. You can also do a little testing of your own. Try releasing the same content at different times of the day and recording which times recorded the most clicks, likes, and shares. This can give you an idea of optimal times for posting your content. More general research can also help you to identify when is best to post your content. For instance, it has been found in a survey by Buddy Media that engagement on Facebook rises throughout the week, peaking on Friday. In fact, engagement on Thursdays and Fridays was shown to be up to 18% higher than earlier in the week. For an in-depth look at how and when to share content on multiple platforms check out this fabulous article by Courtney Seiter, originally posted on Buffersocial. 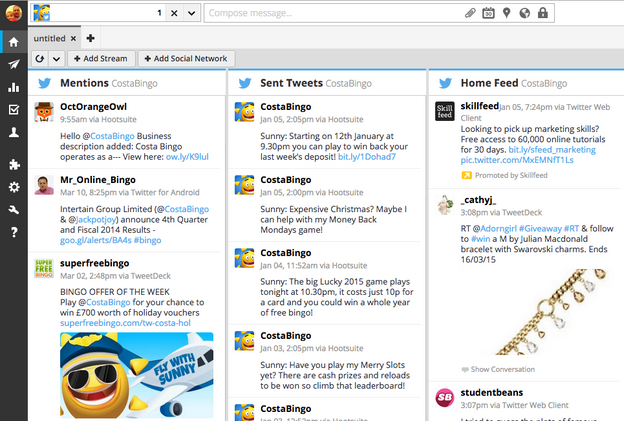 Hootsuite hootlet – Sharing content from around the web on your social channels can be made even faster and easier with this useful Chrome extension. Once you have the hootlet extension installed you can simply click the extension button whilst on any web page or even a Google+ post to open a hootsuite sharing dialogue just like you were already in your dashboard. The hootlet will also pre-populate the sharing dialogue with the title of the page with a shortened link to the url making sharing interesting stuff that you find super quick and easy. You can share posts immediately, schedule for later or you can even let Hootsuite share them at the optimal time using auto schedule. How many tweets/retweets a URL has. The authority of the person tweeting. The number of Facebook shares/likes a URL has. How many +1’s a URL has. The more active you are on social media and the more interaction you get with your social output can have a direct, positive impact on your website’s ranking in SERPs. Google+ has been found to have particular effects on rankings, so make sure to link to your posts from your Google+ page when you publish them. Search engines, particularly google, are always striving to return the most useful, authoritative and credible results for a user’s search query and your social media influence will be taken into account when determining how authoritative your website is. How many people that your posts reach, how much interaction they get and the people that interact with it are factors used to determine your social media influence. For instance if you regularly release great content that is highly related to your business, receives lots of shares and in particular shares from well followed, respected influencers in your niche you will likely start to be perceived as more socially influential. And there you have it, our top 8 amazing benefits of social media to your business! Social media is truly changing the way business is done in the 21st century, a study carried out by the Internet Advertising Bureau recently found that nearly 80% of consumers would be more inclined to buy in the future because of a brand’s presence on social media. An amazing statistic that shows just how big social media has become and how influential it can be to your business. So take note, get involved, and be more social!